It’s been a good week. In London it’s been cold and snowy but I’ve got a lot of work done, and in Barcelona it has been warm and sunny with a lot of training sessions and fitness/sport holidays. But now it is Friday so time to relax with my blog and look at the lighter side of Pilates. I changed my career from a desk-bound job in the City of London many years ago to teach Pilates and wellness because I wanted to get more satisfaction from my work, and because I wanted to help people. Having educated hundreds of Pilates teachers all over the world, I know for a fact that many of us are motivated by the desire to help other people. But who would have guessed that we would be helping Kim Kardashian? It’s the time for New Year Resolutions, many of which will be about health, weight-loss, fitness and happiness. If we pray or ask the Universe for happiness, the Universe will not give us happiness, it will give us the opportunity to find happiness. If we ask for health, we are not given health, we are given the opportunity to get healthy. I’m sure you get the principle. With this in mind, I want to ask you what will you be doing on your holiday this year? Have you ever had a “guilt-free” holiday? In the past, many people saw their holiday as not only a time to relax and get away from the stress and strains of everyday life, but also a time to forget fitness and health regimes, and eat, drink and then eat some more. The popularity of the “all-inclusive” holiday has only made things worse. If the food and drink is free, then why not make a pig of yourself? Besides, you are on holiday so there are no rules! The notion that overeating and drinking is “living a little” or even “treating” yourself makes absolutely no sense at all. So this year instead of spending the winter and spring months dieting and working-out in order to look good on holiday, then pig-out for a couple of weeks whilst away, and then start losing weight again ready for the annual Christmas binge, I have a suggestion. Why not have a holiday where you do not undo all the hard work you do for the rest of the year? Why not have a holiday where you do not have to feel guilty everyday and even more so when you get home? Why not have a holiday where you go home fitter, stronger, more relaxed and proud about having achieved some new experiences? You do not have to pray for this, it is all possible, and with Barcelona Bienestar together we can make it happen. Bienestar is Spanish for “wellness”, and my business offers fitness holidays, sports holidays and many retreats to Barcelona and Ibiza. We offer 17 different sports (including hiking, cycling, golf, surfing, stand up paddling, mountain biking, scuba diving, tennis, horse riding etc), all of which can be done by anyone, from experts who want to improve to first-timers who want to learn. We offer dozens of fitness activities and techniques (including Pilates, TRX, HIIT, boxing, group training, personal training, circuit training, boot camp, tabata etc), and these again are suitable for beginners and more experienced exercisers. Lastly we offer several different retreats (such as wellness, detox, weight loss, meditation, yoga, team-building and corporate). We also offer family activity holidays. The beauty of our holidays are that as well as offering packages that we have built for you, we also offer you the chance to totally build your own holiday from scratch. You can choose any of the sports and any of the fitness activities in any combination. We can arrange your accommodation for you (from beautiful farmhouses with private pools to apartments in the city), transfers and help you with any other aspects of your holiday. Do not misunderstand me. As the pictures on my social network sites show, I love to enjoy myself in the best bars and clubs in Barcelona and Ibiza. I love the wonderful food here. Play hard is all part of a balanced life. But to do these and not feel guilty, to do these things knowing they are part of a healthy lifestyle, is truly having fun. With this in mind, we can also organise excursions to the wonderful local attractions, and nights out for you and your group. And of course there is always time to relax on the beach and have one of our relaxing massages. You can do as much or as little as you want to. Interested? Well it gets better. If you bring with you a group of 8 people, then as organiser you get your accommodation and all activities for free! We can even pay for your flight (or at least contribute towards this dependant on the total cost). So for a little bit of organising, you can have a free holiday, or share this discount with the rest of your group. You will be surprised as to the cost of our holidays, as they are typically much cheaper than you might think. There is lots more information on our website, www.barcelonabienestar.com and you can ask as many questions as you wish. Chris Hunt is an international Pilates and functional training presenter and educator based in London and Barcelona, Spain. He is the creator of Pilates EVO©, bodyFUNC©, and CEO of Pilates Rehab Limited and Sport Core Strength. He also created Pilates Carnival and Fitness Carnival, conventions where all profits go to local children’s charities. He organises retreats, fitness holidays and sports holidays in Barcelona and Ibiza. For more information about training with Chris in Barcelona and Ibiza, please click on Barcelona Bienestar. To learn more about Chris Hunt, please read Just who is Chris Hunt anyway? You can also subscribe by completing the form on the this BLOG to receive articles and special offers straight to your inbox. I love writing about Pilates, but I especially love writing about Pilates and men. I have done it many times before, and I hope that I will do it many times again. The reason I love it so much is that we all know just how much benefit men get from doing Pilates, so it is a crying shame that more don’t do it. We all know the facts; that Joseph Pilates was a man, and that he trained other men many years before Pilates become synonymous in many people’s minds with dancers and women. Here in Barcelona, I have lots of men who come on my Barcelona Bienestar fitness and sport holidays where Pilates forms an integral part of the training. 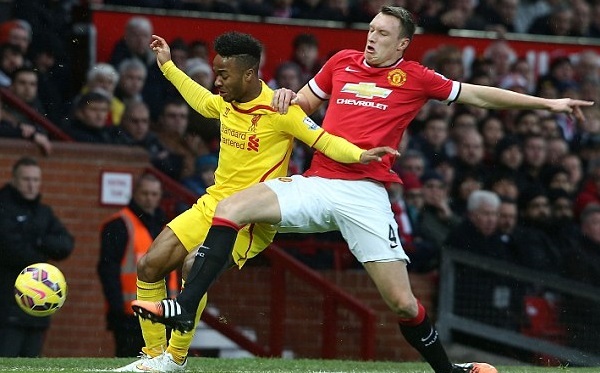 I hope that Phil Jones’ story might encourage a few more men to venture into a local Pilates studio or join a class. Manchester United defender Phil Jones is the latest Premier League footballer that has turned Pilates in a bid to overcome the injury problems that have blighted his early years at Old Trafford. The England international made his latest comeback for Louis van Gaal’s team in the recent 3-0 Barclays Premier League win over rivals Liverpool. Jones was rushed back ahead of schedule but came through unscathed and afterwards he revealed he has turned to some of the game’s more modern conditioning methods as he bids to maintain fitness. I hope that Phil Jones’ story might inspire more men to take up Pilates. Chris Hunt is an international Pilates and functional training presenter and educator based in London and Barcelona, Spain. He is the creator of Pilates EVO©, bodyFUNC©, and CEO of Pilates Rehab Limited and Sport Core Strength. He also created Pilates Carnival and Fitness Carnival, conventions where all profits go to local children’s charities. He organises retreats, fitness holidays and sports holidays in Barcelona. For more information about training with Chris in Barcelona, please click on Barcelona Bienestar. To learn more about Chris Hunt, please read Just who is Chris Hunt anyway? You can also subscribe by completing the form on the this BLOG to receive articles and special offers straight to your inbox. Free Retreats, Fitness and Sports holidays in Barcelona and Ibiza! Free Retreats, fitness and sports holidays in Barcelona and Ibiza? Really? Surely in this day and age nothing comes for free, afterall, there’s no such thing as a free lunch? Maybe, but here is a wonderful opportunity that for just a little effort, you can get yourself a free fitness or sport holiday in Barcelona or Ibiza. First things first, who are Barcelona Bienestar and what does bienestar mean? It’s Spanish for “wellness”, and it’s what we offer to people from all over the world. Barcelona Bienestar are the experts in retreats, fitness and sports holidays to Barcelona and Ibiza. We offer a VIP tailor-made service to clients from all over the world. Our clients have visited us from places including Russia, the USA, China, Germany, France, Italy, the UK, Canada, Brazil, Latvia, Australia and Thailand. Why? Because everyone loves Barcelona and Ibiza! They are on most people’s wish-lists for a vacation, so what better than a dream holiday that includes health, fitness and sport? So what do we offer our multi-national clients? Simple answer is anything they want. We have no barriers, no limitations. We have never failed to deliver exactly what our clients ask for. From fitness, sports, restaurants, secluded farmhouses, night-club entry to privates cruises on a beautiful yacht. We teach in English, Spanish and Russian. Todo es posible as we like to say in Spain. We offer an amazing range of sports because in and around Barcelona and Ibiza there are so many possibilities. Sports we specialise in include surfing, SUP, snowboarding, skiing, mountain biking, kite surfing, rock climbing, hiking, golf, football, scuba diving and tennis. Our holidays will give you the chance to have specialist training for the sports of your choice, and also the chance to take part in that sport, everyday of your holiday if you wish. So if you want to learn a new sport, or get better at a sport you already love, then we can help. We help our clients to achieve many different fitness goals including cardio fitness, muscle gain, weight loss, and we love to teach people new techniques. We use many different methods including personal training, group training, Pilates, yoga, HIIT, TRX, body weight training, boxing, kettlebells, tabata, weighted vests, circuit training and many more. We can train you inside, or even better outside. We use quiet secluded places, and we use the beach, parks and the mountains. We work with many businesses to orgainse leadership and teambuilding events that are always very popular. You are free to choose one or many of these activities to make your retreat perfect. We can help organise as much or as little of your holiday as you wish. You only have a to organise your flights and we can do all the rest. We can arrange accommodation to suit your budget and your needs, from private farmhouses to beautiful hotels. We can give you a special diet or detox. Even after your daily program of sport and fitness, there will still be plenty of time to explore, enjoy and relax. We will help you hire a car or even better a bike. We will tell you the best beaches in around Barcelona and Ibiza, and the best restaurants. We can usually get you a reduced or free entry into the best discos, bars and places to dance all night. We know how to train hard, but we also know how to play hard as well. We also offer a personal photographer to capture some of the special moments of your holiday. We can also organise excursions to the famous landmarks in and around Barcelona and Ibiza. We can book you treatments including sport massage, relaxation massage, physiotherapy and chiropractic. Remember, todo es posible. Even after your sport or fitness holiday or retreat to Barcelona or Ibiza is over, our service does not stop there. We offer online programs to keep up the good habits you started on holiday with us. We will also keep you updated about sport and events and when you come back for another holiday (over 75% of our clients come back) then you get a special loyalty discount. So, enough talk you are thinking, how do I get a free holiday? It’s simple, and here’s how. First, please like and share our FACEBOOK page. We will be checking! If you are a trainer or club owner, then bring a group of your clients (minimum number of 8), then you get your holiday for free! You can either enjoy receiving fitness sessions for a nice change, or if you love what you do so much that you just can’t stop teaching, and you are a certified and qualified trainer, then we can incorporate some of your own training sessions into the holiday. If we like what you do, we might invite you back to Barcelona or Ibiza as one of our trainers. If you are not a trainer but just love keeping fit or playing sport, why not get a group of your friends or sports club together and enjoy a fitness or sport holiday in sunny Barcelona or Ibiza. Again, all you need to do is bring 8 or more friends and you will get you holiday for free. We only have a limited number of weeks available next year for this special offer, so please contact us as soon as you can so we can discuss your requirements, and start planning your dream holiday. You will have a holiday in Barcelona or Ibiza that you will never forget. Remember, when you chose Barcelona Bienestar, todo es posible! Chris is an international Pilates and functional training presenter and educator based in London and Barcelona, Spain. He is the creator of Pilates EVO©, bodyFUNC©, and CEO of Pilates Rehab Limited and Sport Core Strength. He also created Pilates Carnival and Fitness Carnival, conventions where all profits go to local children’s charities. 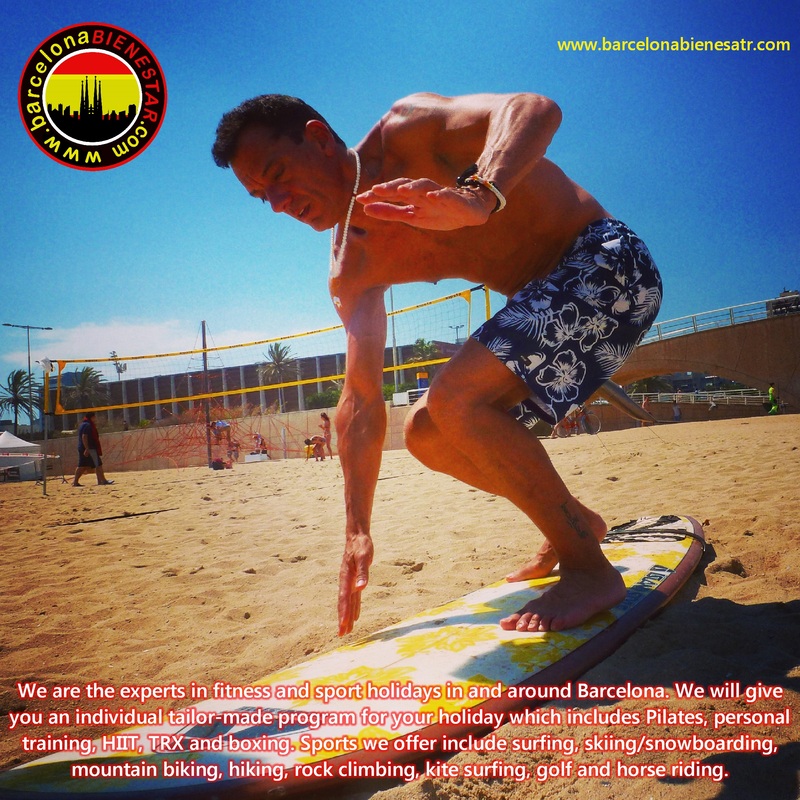 He organises retreats, fitness holidays and sports holidays in Barcelona. For more information about training with Chris in Barcelona, please click on Barcelona Bienestar. To learn more about Chris, please read Just who is Chris Hunt anyway? You can also subscribe by completing the form on the this BLOG to receive articles and special offers straight to your inbox. Chris pays all profits made from this BLOG to his charity partners. More details can be found by clicking on www.chrishuntwellness.com and selecting the “charity partners” tab. A holiday means many different things to different people. Some people go to a beach resort to relax in the sun. Some people choose adventure holidays to explore. Some people like sightseeing breaks or a more gastronomic emphasis to immerse themselves in a different culture. Some people choose sport-based holidays to practise their favourite hobby or try something new like golf, horse-riding, skiing or snowboarding, mountain biking, kite surfing, surfing, SUP (stand up paddle) or hiking. So why is a holiday to Barcelona such a great choice? It is because in Barcelona you can have every one of the holidays mentioned above. More people are choosing to have some organisation to their holiday. The days of the traditional package holiday may be long gone as people use the internet to create their own designer holidays, but more people want something constructive to do on their holiday. But they do not want a hotel-organised series of events or classes that the hotel manager thinks you will like at a time specified by the hotel. They want a tailor-made, personal itinerary that fits in with individual particular requirements and timescales. This is where Barcelona Bienestar answers the needs of our clients. There is nothing we cannot arrange and organise for our clients who come to us from all over the world. Barcelona is such a diverse and interesting city and we complement this by giving our clients a personal itinerary so they can maximise their enjoyment of their holiday. We offer a health and wellness package based around whatever interests our clients. Fitness activities include personal training, Pilates, TRX, boxing, weighted vest training, functional training, HIIT, and programs based around specific sports such as Stand up Paddle (SUP) fitness, skiing/snowboarding, surfing, walking, mountain biking, rock climbing and many more. For all these activities, we arrange time not only training, but also practising. So you will get time on a surf board, on the slopes or on a mountain. But it’s not just physical holidays we offer. We also offer a range of wellness and beauty services including massage, diet, weight loss, eye lash curling and extensions, gel nails and meditation. We also organise cultural holidays including the arts and gastronomy, and we give advice on all aspects of Barcelona from the best restaurants to the best sights to see. We take the stress out of organising your holiday, but you are always in control so you have exactly the holiday you want and need. We can simply arrange your activities, or on a full package we can organise your hotel, meals and transfers as well. What ever you want and need. We have clients from all over the world including America, England, Germany, Sweden, Russia, China, France, Italy, Holland and Australia. For more information, click on www.barcelonabienestar.com or contact us and let us organise your dream holiday for you. Barcelona is waiting for you, and so are we. Some people go to a beach resort to relax in the sun. Some people choose adventure holidays to explore. Some people like sightseeing breaks or a more gastronomic emphasis to immerse themselves in a different culture. Some people choose sport-based holidays to practise their favourite hobby or try something new like golf, horse-riding, skiing or snowboarding, mountain biking, surfing/SUP or hiking. Others might want music and the arts to form the basis of their vacation. So why is a holiday to Barcelona such a great choice? It is because in Barcelona you can have every one of the holidays I mention above. But it’s not just physical activities we offer. We also offer a range of wellness and beauty services including massage, diet, weight loss, eye lash curling and extensions, gel nails and meditation.